We pride ourselves in being Wyoming owned & operated. 8 locations throughout Wyoming... and still counting. Click HERE to use our interactive location map and find the closest location to you! Our Powell location is our first location in northern Wyoming. Nestled just east of Yellowstone National Park and just south of the Wyoming/Montana border, we are so thrilled to be serving a new area of Wyoming! This wash is very similar to our East Casper location and boasts the newest of the IQ Touch Free & Soft Touch technology for the automatic washes (yes, FREE vacuums included)! Casper, WY- East 2nd St.
Our East Casper location now allows us to serve both sides of Casper. This location boasts new Soft Touch Automatic technology from D&S Manufacturing, along with a Touch Free Automatic and 4 self-serve bays. This wash is our first car wash with FREE vacuums. Come visit us in between Buffalo Wild Wings & Pizza Ranch on East 2nd Street in Casper! Just south of Casper, is the small town of Douglas. Douglas hosts the state fair every year, is a busy oil & gas town, and has great outdoor activity opportunities. Our wash in Douglas is on the main drag of 4th Street, and is conveniently located for your drive in, drive out luxury. Containing new automatic wash technology, it has 2 automatics, 4 self-serve bays, and 4 vacuums. Casper, WY- CY Avenue NEW EQUIPMENT! Our first car wash in Casper, WY and our first wash debuting a new era of Rocky Mountain Car Wash. This wash is situated on the busiest street in Casper, CY Avenue. This wash contains 2 automatic bays, 3 self-serves, and 4 vacuums with new state-of-the-art equipment. In December of 2017, we installed the newest in automatic car washing technology - an IQ Soft Touch and an IQ Touch Free machine. With the most passionate car wash staff around, let our car wash manager or attendant help you with any car wash questions you may have. Let the blue wave monument sign guide you to all of your car washing needs while you are on your way to grab the groceries! Riverton, WY- W. Main NEW EQUIPMENT! Our second car wash in Riverton, WY. This car wash serves the other side of Riverton, in comparison to our North Federal car wash. The W. Main wash has one IQ Touch Free 2.0 automatic and 3 self-serve bays, along with 3 vacuums. We are proud to serve both ends of Riverton! Green River, WY NEW EQUIPMENT! Located in southwest Wyoming, lies our Green River car wash location. Green River is directly west of the busy city of Rock Springs, WY by only 10 miles and is a major outdoor recreational area. Our Green River location is main street frontage, right off Uinta Drive. Rocky Mountain Car Wash is one of the first businesses right when you pull into town! With 2 self-serve bays, 2 automatics, and 4 vacuums... we have everything a small town needs. Whether you are just passing through on the interstate or a Green River resident, come on by! Riverton, WY- N. Federal NEW EQUIPMENT! Our "Taj Mahal". The North Federal Ave. location in Riverton was our first wash built in Riverton and to this day remains our largest wash with 2 automatics, 5 self-serves, and 6 vacuums. This location received the newest in IQ 2.0 smart scanning automatic wash technology in May of 2018! We now offer a Soft Touch AND Touch Free! With this centrally located carwash right on the main street drag in Riverton, you can't miss it while driving through! We are open 24 hours and our staff is on site every day willing to assist you. Our "hometown wash". The Pinedale, WY location was our very first car wash which opened in 2001. 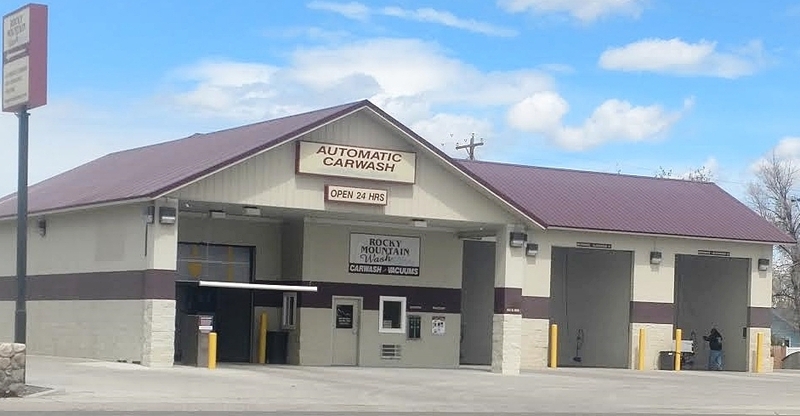 Also located in Pinedale are the corporate headquarters of Rocky Mountain Car Wash. Nestled in the heart of the Wind River Range- this wash has 2 automatic bays, 5 self-serve bays, 4 vacuums, and is the only car wash with a laundromat. One of the automatic car washes was recently upgraded in October of 2017 and now has the latest D&S Car Wash equipment, the IQ 2.0 Touch Free machine! Our laundromat is located in front of the Pinedale, WY car wash, right off of main street! It is 24 hours, with FREE WiFi! In January of 2018 the laundromat received NEW washers and dryers! Come join us for laundry day today! We are the only 24 hour laundromat in Pinedale.